Picture from bryanmccabe : Four lakes in one photo, taken on a ridge running SE off Slieve Carr. 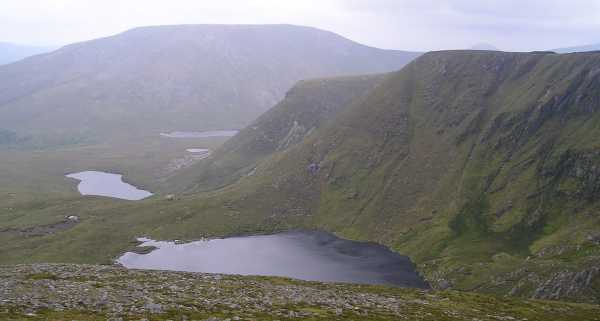 Picture: Four lakes in one photo, taken on a ridge running SE off Slieve Carr. Distance to summit: 13.2km, took us 4 hours 15 mins. Total round trip distance: 26.9km, finished in just under 8 hours overall including all stops. Don't be fooled by the modest height of the summit at 721m, the accumulated height gain for this hike is a considerable 1266m; as both Bangor Trail and Western Way are undulating routes. For example, after 8.3km on the Bangor Trail (at a grey post), the point at which we departed the trail to head for Corslieve, the elevation was 154m yet we had already accumulated 371m of ascent! The ascent from the saddle between Nephin Beg and Corslieve to Corslieve is steep; don't forget the Lucozade! Thereafter the gradient up to the summit cairn and trig pillar is kind. When coming off the mountain, the spur north of the corrie lake marked 389m on the OSI map offers an easy and scenic descent. The photo shows that you can actually see four lakes (some corries) all at once; Nephin Beg is the mountain in the background. This spur also conveniently lines you up for the forest road at F936124 D D, and is visible from the top of the ridge on a clear day. There is a little clearing which will lead you to the road; although beware of deep forest drains covered in long grass. Turn right and after 1.7km, this track drops you onto the Western Way. Turn right, signed Nephin Beg. A further 8.5km will return you to the start. We brought trainers to change into when we got to the track which made for a hastier and more comfortable egress; we all know unpleasant it can be to walk with hiking boots on hard surfaces, especially having already walked 16.7km!